Are you on the hunt for magnetic toys for toddlers? If so, you will have seen that there are tons of options available online and it can be incredibly confusing trying to find right ones. Well, that’s why we’ve researched and reviewed the best options that are currently available. You can save all the hassle of trying to look around for hours online and take a quick look at our detailed list. There’s a buyers guide available at the end which provides you with additional information to make finding the best magnetic blocks for your toddler super easy. 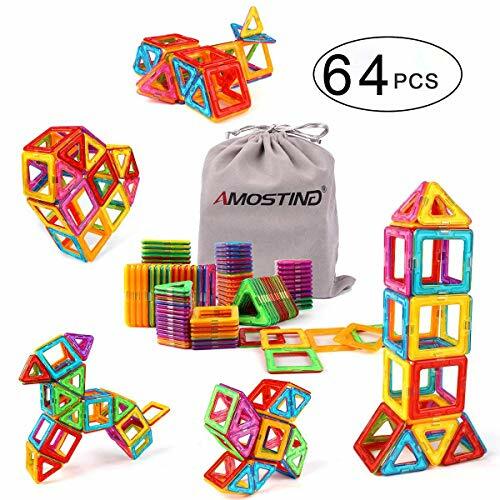 This is a 64-piece set of magnetic building tiles includes various shapes and colors, which serves as an extremely well-made educational toy. Not only will your kids have a lot of fun making different structures out of these building tiles, but they can also learn about shapes, colors, alphabets, and numbers. The tiles have an Environmental Protection ABS material Arc Design with smoothed edges that makes them safe for children to play with. They’re extremely durable and very easy to clean too. Since all of the magnets are encased in thick plastic shells, there is no danger of children swallowing magnets accidentally. Additionally, all of the tiles have natural permanent magnets which makes them last long. All of the tiles are easy to disassemble and a storage bag comes along with this set making the entire set of tiles easily portable. So, let your kid’s imagination fly as those creative little hands build numerous geometric designs with these tiles, ranging from simple structures like letters and basic shapes to complex designs like buildings, robots and animals! This is a well thought-out educational toy that lets the kids explore their creativity and put their ideas to work as. It offers them the chance to create numerous shapes, designs and even other toys out of these variably shaped and colored magnetic tiles. This is a 60-piece set of clear magnetic building blocks that includes various shapes and colors, which serves as a recreational, creative, educational and fun toy. These blocks give your kids the opportunity to create a large number of castles, animals, flowers, robots, stars, vehicles and other 2D or 3D structures. So, you can expect them to be busy for hours. The structures made with them don’t collapse easily because of the strong magnets inside , giving the kids a sense of accomplishment and a better practical understanding of physics. The blocks are made by an ultrasonic welding process and have a double layer ABS shell, which ensure greater durability and tightness. The smooth design and rounded edges make the blocks easier to clean and safe for the hands of little kids. So let your kids have hours of fun with this toy as they develop their logic and creativity while learning colors, shapes, geometry, magnetism, 3D forms, spatial arrangements, architecture and more! We couldn’t find anything negative about this toy set! 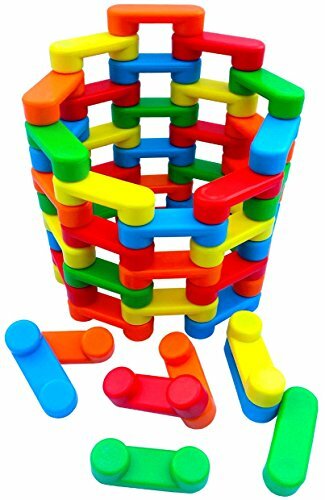 A set of clear magnetic building blocks of various shapes, sizes and colors that allows the kids to put their imagination to the test as an endless number of sturdy structures can be made. This is a 6-piece set of magnetic gears that can be attached to any surface that has metallic parts. It allows kids to have a fun time turning and interlocking the gears which is fantastic for their motor skills and hand-eye coordination. The gears are brightly colored, making them very attractive to look at. The magnets at the back of the gears are strong enough so that they don’t fall off the surface that they’re attached to, even when they are spinning. One of these gears has an on/off switch that serves as the central gear to start the motion of the other gears. 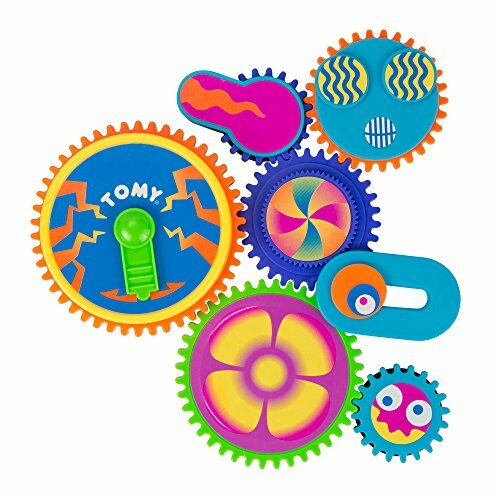 All in all, this is a cool and creative toy for children who like to explore their imagination and spin some gears of their brains! This is a brightly designed set that comes with a unique gear turning feature which toddlers have been having a blast with. It also develops their motor skills and coordination. Letting your kids play with shapes from a young age is a fantastic way to improve their knowledge on the different shapes. This set makes that exciting as a result of the brightly colored magnetic cubes and spheres. With such bright colors and various shapes available, your child will be able to play with the set more imaginatively and use their creative thinking skills. These wooden blocks have built-in magnets that attract each other and make it easy to stack them up and create a large number of different structures! The product contains 6 blocks and 2 balls of different attractive colors. It is one of the best creative playthings for your toddler and your little architect is sure to love it. The bright colors make this set more exciting for toddlers to play with. They also encourage toddlers to improve their shape recognition skills. 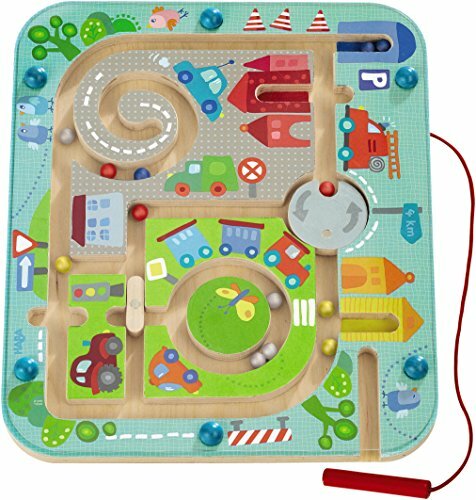 This set includes a town maze constructed on a board with some colorful balls have lost their way home. All they need is for your little one to guide them to their respective residential address. Use your magnetic wand to slide it over a plastic cover and you’ll have them home in no time. As they navigate the magnetic pieces around the board using the wand, toddlers are able to improve their hand-eye coordination. The toy contains bright and colorful pieces which is exciting for kids. It also promotes early language development and keeps toddlers engaged for hours. This set is a lot of fun for toddlers and helps to develop their hand-eye coordination. This toy set consists of magnetized blocks of the same shape but different and bright colors. These blocks can be stacked and attached to each other using their magnetic interlocking feature to create a varied number of structures. The building and stacking process is awesome for your toddler’s motor skills and hand-eye coordination. Moreover, stacking these blocks is a fantastic way to encourage kids to think more creatively. This is because they can make larger and more complex structures using the magnetic blocks. This toy gives wings to your kid’s imagination and creativity as they make wonderful structures and designs out of these uniformly-shaped building blocks. 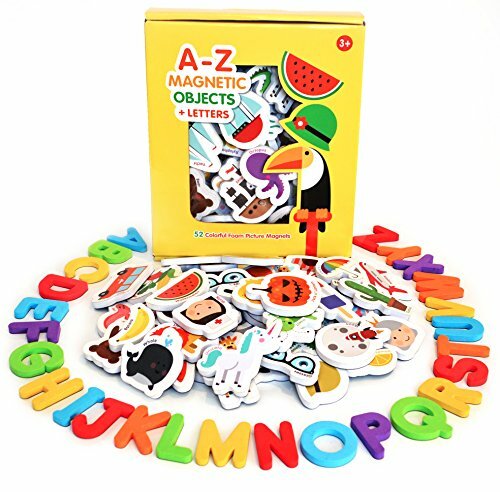 This toy set consists of 2 full sets of A-Z object pictures (a total of 52 objects) and one set of all the uppercase letters of the English alphabet! The object pictures include animals, vehicles, fruits, vegetables, birds and more. All the letters and objects are brightly and variably colored, making them super attractive and fun to play with. In addition to this, the vowels in the alphabet have been colored in blue to differentiate them from the consonants. The components are all made of high-grade foam which is chunky and soft to touch. The objects and letters are perfectly sized for little fingers. They have fully magnetic rubberized backs and thus no little magnets can come out of these toys. This toy has been lab tested to US safety standards, making it completely safe for children. This toy set can be a launch-pad for your child’s education in a very fun and entertaining manner. You can also be sure that they’ll remain safe while playing with it too. 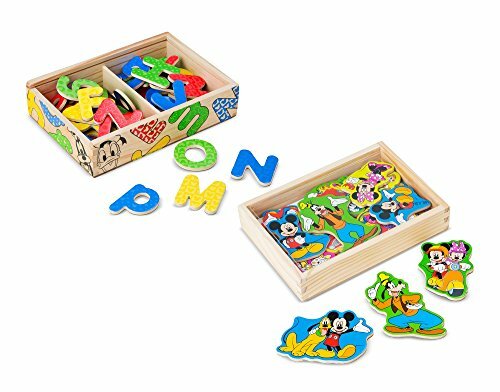 This package has 20 Mickey Mouse themed wooden magnets which come in a beautiful wooden storage box, giving way to easy portability. The magnets include Mickey, Minnie, Goofy, Donald, Daisy and more! These magnetic wooden characters can be attached to any metallic surface, removed and reattached easily by any toddler. This will enhance your kid’s mix and match skills, hand-eye coordination and fine motor skills as he creates his own scenes and stories with these magnets. The pictures peel off quite easily and are not durable. This toy set is a great way to use some of your child’s favorite characters to improve their fine motor skills and hand-eye coordination at the same time. If your kid loves to draw, this is the perfect gift for them. 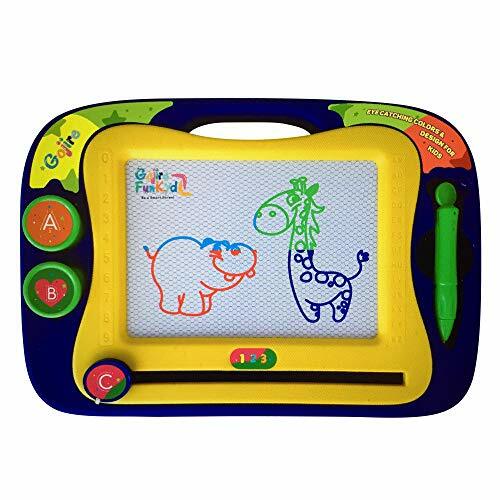 This magnetic toy for your toddler allows them to draw on the magnetic drawing board with a stylus pen in four different colors. The set has additional magnetic stamps and stickers that your child can use on the for a more vivid drawing experience. The board displays four different color zones, giving way to more creative outputs. There is also a magnetic eraser at the bottom of the board which your child can gently slide to erase all pictures on the board and reuse it. The toy is made of durable, non-toxic, lightweight ABS plastic which makes it safe for children and easily portable. This toy brings out the hidden artist in your toddler and gives them the chance to put thier creative thinking skills to good use. Almost every kid loves to see cars, planes and trains. What’s better is being able to play with them. This toy fulfills all of those needs. 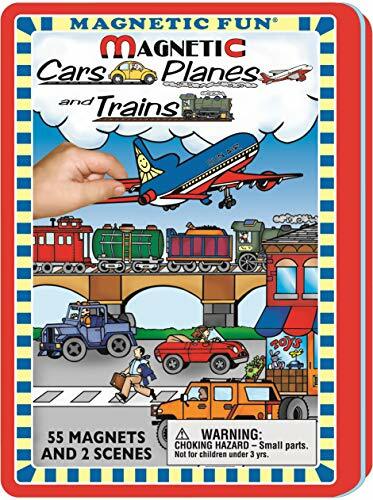 The tin container comes with 3 sheets of magnets and 55 magnetic cars, planes and trains in total, allowing your kid to create full scenes with these vehicles on the sheets. The fully colored scenes are provided on the inside of the tin container for guidance. Let your kid travel around the world as they make their imagination take flight while creating fun artwork. This toy is extremely useful as it comes with a collectible carry case for easy clean-up after playtime is over and easy portability. This set provides children with an exciting vehicle design which they’ve been having fun with, while also developing their creative thinking abilities. 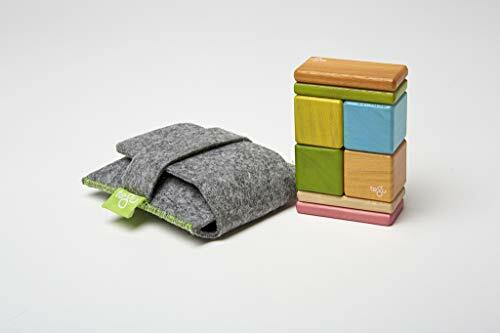 This mini set of wooden building blocks allows your child to build on the go, anywhere and anytime. It’s superb in terms of portability because of the mini purse container, which is something that parents have been appreciating. The set provides toddlers with the chance to use variably shaped and colored pieces to build with. This is great for their color and shape recognition skills, as well as their creative thinking abilities. We also found that it has a positive effect on their motor skills and coordination. This is an easy to use toy set which helps to develop a toddler’s creative thinking, motor skills, and coordination. Every kid wants to copy their parents and fishing is one of those activities that your child may have expressed an interest in. This toy enables them to have the fun of fishing without actually diving into the risks of the real deal. 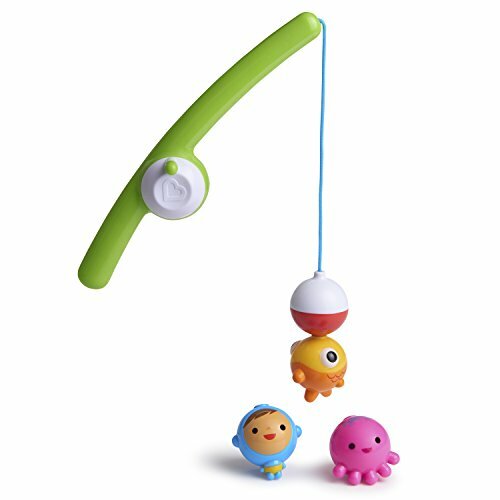 These are fishing bath toys which provide your toddler with the experience of fishing using the magnetic fishing rod and the three underwater bobbling characters. We liked how they can easily attach to the rod to avoid any frustration. This activity is an excellent way for your child to improve their hand-eye coordination and motor skills. If you’ve been struggling with your toddler when it comes to bath time, this could be the perfect toy. It’s also great for their motor skills and coordination. This toy is unique as it allows you to order a customized name puzzle for your child. 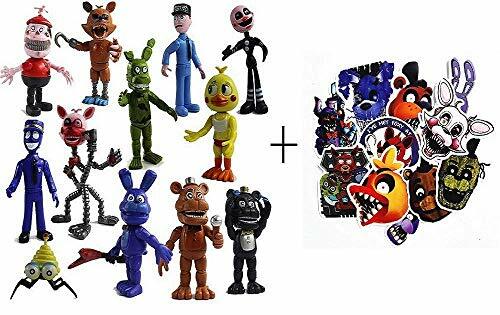 You can order any name up to 9 characters to be printed on the puzzle pieces. Any kid is bound to feel elated seeing their name carved in high quality wood and painted with bright colors. The puzzle pieces are quite large and clear for toddlers to read. Therefore, it encourages them to improve their reading abilities. The puzzles available are also a lot of fun and help to develop your child’s memory and logical thinking skills. We liked how you can print your child’s name on these blocks as it encourages them to improve their reading abilities. 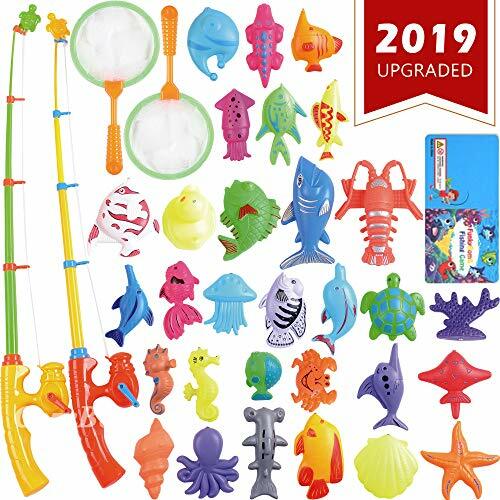 This toy set provides a magnetic fishing game set for kids with 30 kinds of toy fish animals to have fun with. The fishing game is effective at mimicking the experience of real fishing, but in a way that’s safe for toddlers. We also liked how it develops their hand-eye coordination and motor skills. Not to mention, since the various pieces are available in bright colors, it’s more exciting and improves their color recognition abilities. The toy set is designed for interactive game play among toddlers and their parents. So, it can make for some fun bonding time. Toddlers have a blast playing with this toy set with their parents. It’s awesome for developing their color recognition skills and hand-eye coordination too. This is a magnetic 3D puzzle set that comes with 9 blocks. We liked how each of these blocks has a different animal on each side of the block. 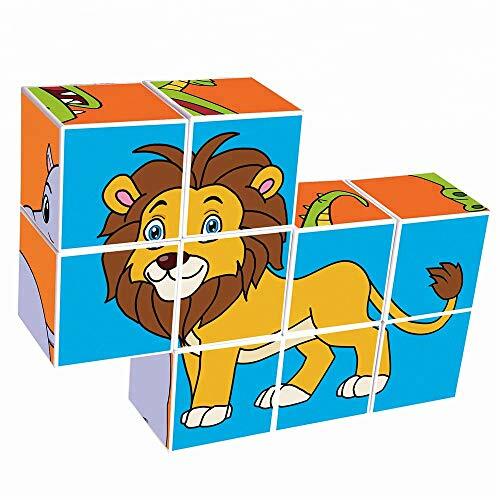 It paves the way for creating multiple animals with the same blocks, sharpening your child’s mind and problem solving abilities. Moreover, this toy is made of the eco-friendly ABS material, with no sharp edges, making it safe for toddlers to play with for hours of fun. The blocks also contain permanent magnets inside them which keep their shapes and function properly for years. Toddlers & parents have been loving this set! This set improves your child’s problem solving abilities and logical thinking, while also ensuring that they have a blast while playing as well. This buying guide is written specially to aid parents looking to gift their toddlers an experience with magnetic toys. Be it for gifting over the Holidays or as presents on a birthday, we have compiled a list of the best magnetic toys that the internet has to offer. This guide is here to help our patrons decide on what to buy and how to pick the perfect gift for their children from our awesome list of suggestions. Although we feature a wide range of toys in our list, we recognize not every toy will be for everyone. We have broken down our list of suggestions into the following broad categories to make it easier for you to distinguish between the various kinds that are available. Magnetic board games are a massive hit with toddlers. They’re always fun to play and is engaging enough to keep you children busy for hours. We have a wide range of magnetic games listed for your selection and all of them are very highly recommended. Puzzles have been proven to increase spatial awareness and enhance children’s IQ. The magnetic puzzles in this review are challenging enough to help your toddler develop their logical thinking, while not being overly difficult for a 1-3 year old. 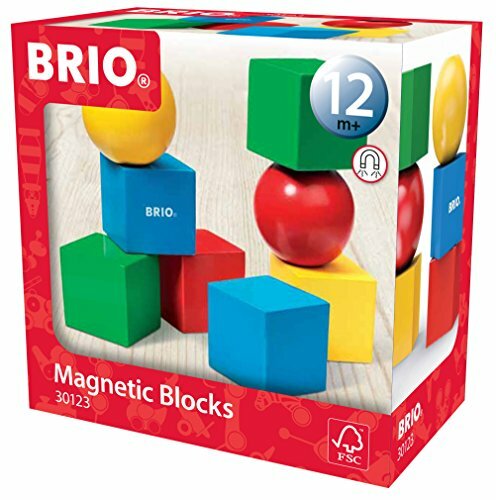 Magnetic blocks are fantastic for helping your toddler to develop their hand-eye coordination and motor skills. Furthermore, since they are building magnets to make various structures, their creative thinking skills also come into play too. 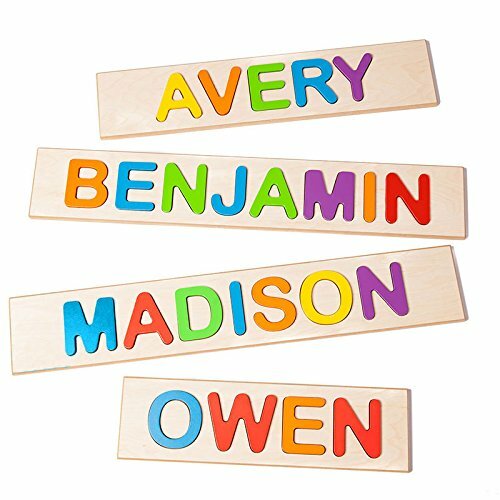 Magnetic letter sets are an excellent way to start introducing your toddler to the alphabet. Since the sets are fun to use, it encourages kids to want to continue broadening their knowledge. Fridge magnets can be a fun idea for toddlers. You could set some time aside to decorate your fridge with the help of your toddler – it could make for some awesome bonding time together. If you have a toddler who has taken a keen interest in cars, a magnetic toy car set would be a great idea. They’re able to continue playing with cars, while also improving their hand-eye coordination and motor skills. Magnetic shape toys that come in a variety of shapes are excellent for toddlers. They expose kids to a wider range of shapes which they may not be familiar with. As they play with the magnetic shapes sets more and more, they’re able to improve their knowledge and recognize the different shapes that are available. When you’re searching for magnet sets for toddlers, you can feel confident in knowing that the ones we’ve reviewed here are safe. However, there are a couple kinds of magnetic toys for toddlers that you may want to avoid. Magnetic bead toys are usually not recommended for toddlers because if the beads come loose, there could be a lot of small pieces laying around. This could result in a choking hazard among toddlers. Magnetic ball toys are another kind of set that we don’t advise toddlers play with. The balls could also be a choking hazard. Not to mention, toddlers may slip over them and cause accidental injuries since they may still be learning to walk on their own. Magnets are also great at developing hand-eye coordination and improving general motor skills. Even a simple magnetic fishing game has been shown to have increased coordination and neural responses in children when played for an hour a day. They also allow children to develop concrete concepts of physics and natural sciences that go on to be of great benefit in adulthood. We have searched high and low to compile the best magnetic toys. They are a broad selection and we offer you everything from board games to puzzles and more. Be it gifting or buying for your own kid, we believe if you will find everything you need to know about magnetic connector toys in this review.